I haven’t really felt any symptoms of pregnancy since Friday. This is weird because I’d been consistently nauseated prior to Saturday. On Sunday, I was using the restroom and noticed a pinkish tinge on the toilet paper after going potty. Of course, I freaked out and called Chris in to have a look (I’m aware of how weird this is, don’t worry). For the next couple of hours, I probably went to the bathroom 10 times to check and make sure everything was okay. It never got super dark, but was noticibly there for most of the afternoon. I emailed our clinic and asked them if there was anything I could do. Since it was Sunday, obviously no one responded. Then I started googling my symptoms. Let’s just be clear–this is NEVER a good idea. I texted my sister-in-law, Andrea, and my friend Krystal looking for reassurance, but I’d already started to spin out. My mind can seriously be my worst enemy. I’ve been working on my anxiety for the past couple of years, but I’m realizing I’m still a serious worry wart. When I get a bad idea planted in my mind it sits there spinning on repeat at all hours of the day. I woke up in the middle of the night thinking the worst. I woke Chris up at about 3 AM to talk about it, that’s how anxious I had gotten. Chris reorganized his whole day today (Monday) so that we could go into the clinic and figure things out. 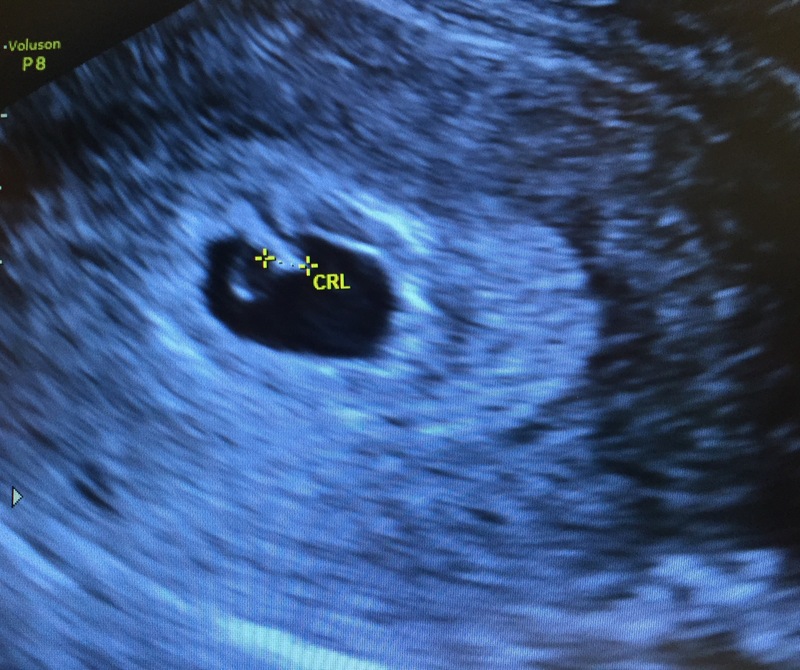 My ultrasound was originally scheduled for Tuesday, so we figured moving it up a day for peace of mind was probably a good idea. It turned out to be the best thing possible that we went in today. For starters, Casper is alive and kicking. Praise the Lord! We got to see his heartbeat for a few seconds on the screen, which was miraculous beyond words. Our doctor is super conservative, and didn’t want the ultrasound in there for too long, since it’s still so early. It was such a joy to see him for even just a few seconds. Casper is the size of an orange seed! Doc said I have a little bit of fluid in my uterus, but it’s not a major concern. However, he said any hint of blood is the body’s way of telling us we need to chill out and take it easy. He said the next two weeks are critical for Casper’s development, and we need my body to be as relaxed and low stress as possible. So, he ordered that I take a two week leave from work. At first, this really freaked me out. I’ve never talked about my profession on my blog, but I’m a teacher and I seriously love my job. I’m super attached to my students, and the idea of being away from them for two weeks was a little more than I could handle at first. I called my boss and explained that I was dealing with a physical challenge, and I’d need to be away. She was absolutely great about it. I spent the afternoon getting together my sub plans for the next week, and reminding myself my students will be just fine without me for a bit. So here’s to two weeks of rest, relaxation, and a full-term, healthy pregnancy.